Summer White Wine Fruit Popsicles look like stained glass, chock full of fresh summer fruit and a Sauvignon Blanc sangria mix creating a refreshing, flavorful alternative for summer Cocktail Hour! 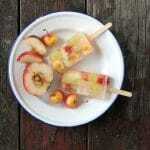 Divide fruit evenly between popsicle mold cavities. Pour liquid into popsicle molds and freeze several hours or overnight until fully frozen. Note: Do not pack fruit into molds or the popsicles may not remain intact when removed. Tip: cover top of popsicle mold with a sheet of foil to stabilize popsicle sticks and prohibit them from floating to the top of the popsicle.